We are excited to provide you with the best Scottsville James River Tubing Experience. This tour option is more than just bus transportation from Charlottesville to Scottsville and back. Our James River Tubing and Brewery Tour is a full day of fun in the sun. Catch one our River Tubing Shuttle at one of our two pick up locations in Charlottesville and head down to Scottsville to relax on the river. Tube down the James River for a couple of hours, soaking up the sun with your friends. After your tubing adventure, head over to the James River Brewery for a pint, or two, or .... Feeling hungry? We got you covered. Your ticket price also covers your meal catered by the Crust and Crumb in downtown Scottsville. Sample local beer at James River Brewery! *Your James River Tubing and Brewery Tour includes all of your Tubing fees and gear, and your meal from Crust and Crumb, and safe shuttle transportation to and from all locations. We do not include any fees for alcohol. All purchases of beer from the James River Brewery must be made by you and the brewery. In case of inclement weather or unsafe river tubing conditions, your James River Tubing Tour will become a Charlottesville Brewery Tour. We will still pick up at the same pick up locations at the same designated times. Adjustments to your tour may not occur until the morning of your tour so that the most up to date weather information can be taken into consideration. 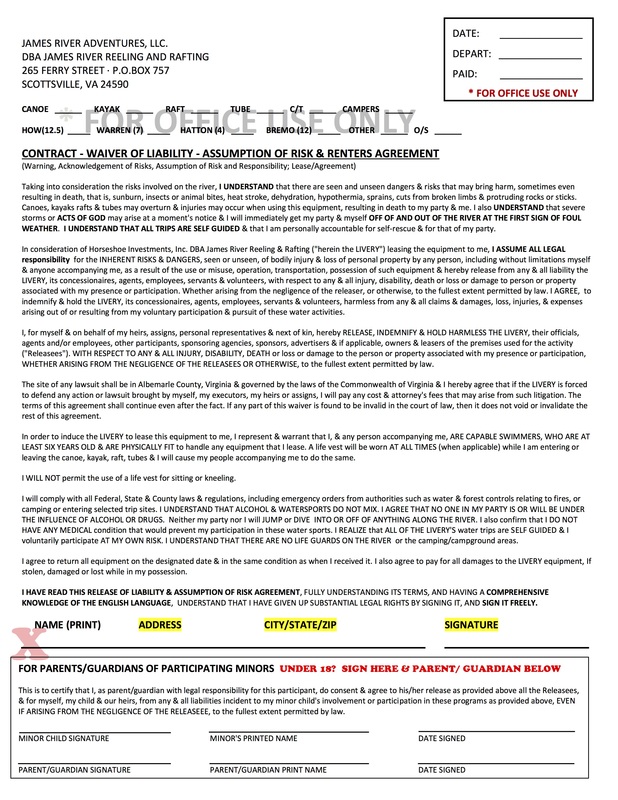 Please download and fill out the waiver before your tour and bring it with you to James River Reeling and Rafting.